PBL and Technology Twitter Chat – Just a quick note to let you know that Graphite which is part of the Common Sense Media Organization will be hosting our their first #GraphiteChat this Thurs (4/16/2015) at 7 PM – 8 PM EDT. The theme of the chat is “Weaving Tech into Teaching with Project-Based Learning,” I know I plan on attending and learning from others and hope to see you there. Discover more about the event at this link. There are many educators that believe that Project Base Learning must be integrated with technology. In a sense this could be correct, although it depends on the definition of technology. One must remember that John Dewey was an advocate of projects long before the laptop computer, or even mainframe. He did believe that students must be doing, and this does involve something beyond sitting in a row listening to a lecture. Doing involves using tools, and tools are a basic definition of technology. It is for this reason that some form of analog and pre-analog technology should be blended into the learning experience.. In this increasing binary world it is also important to bring in digital devices including the computer, and so many other electronic tools. The SAMR Model ( developed by Dr. Ruben Puentedura http://www.hippasus.com/) must be examined and considered. SAMR is based on the progressive steps of Substitution, Augmentation, Modification, and Replacement. It is the SAMR lens that can be a first step in enhancing the PBL experience… amplifying opportunities with endless possibilities. I would like to suggest that PBL should include some type of blended experience. 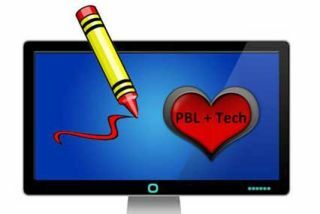 With this idea in mind I have wish to provide to you four indicators that could be investigated when blending technology into the PBL experience.This is a quick preview of one of the building blocks I feel help makeup PBL and deeper learning. The Four Indicators – While PBL does not require all four, it is important to keep in mind that one or all the indicators can be employed to enhance the learning experience. Also, it is important that these indicators be used in alignment with expected standards. You can read more in the future post… Going Beyond the Technology Shine. Analog Tools – In referring to analog I include tools that have been in existence long before the first vacuum tube. Perhaps it is a paint bush, a carpenter’s tool, or some items from a maker’s workshop. These may be referred to as the analog tools. There are all of those the pre-digital age tools that can still be used to engage learning. Take a moment and watch a child play with an old fashion toy and it will become obvious there is still a world of possibilities from a past era. In fact,there are some experiences that the world of advanced technology and computers could never replace. PBL demands that student do… and tools beyond paper and pencil can provided so much. We must never forget that smell of a first crayon, or the joy of playing more with the box… than the item inside. Of course we can also include some of those true analog tools that actually do contain a vacuum tube. Digital Substitution and/or Augmentation – In this area we do explore the arena of digital tools. . In the 21st century classroom digital technology can also be infused. Many times this is used with the infusion of a digital device, either one to one, or in a lesser extent. Through the study of the SAMR Model, educators can learn to Substitute and even Modify activities using technology. This form of integration allows for enhancement and must be carefully thought-out. After all, there may be times and situations that the learning experience could be more powerful and effective with the analog approach. When one or both of these two steps are applied successfully, technology will foster a positive impact on PBL. Digital Modification and/or Replacement – This reflects the second two letters, Modification and Replacement, of the SAMR Model. You may wish to learn more about the SAMR Model and how it relates with Bloom’s Taxonomy at this site from Common Sense. At these levels of integration skilled use of technology allows for a true transformation to take place in the PBL environment. PBL experiences are amplified and new possibilities exist that were not possible in the analog only world, or even when digital technology is used to Substitute and Augment. It is at this point that students can venture into real voice and choice, deeper learning, and reapplying of knowledge. This level also allows for students to practice the 4 C’s at deeper levels while moving up Bloom’s Ladder. Keep in mind that much of this can still happen under the analog structure, but together the experience and learning can be further amplified. Connections to authenticity can be strengthened. Digital Tools Beyond the Device – It must be remembered that the digital world goes beyond just the binary devices whether it be a computer or tablet. There are a multitudes of digital possibilities including toys, cameras, GPS units, games, robots, and some amazing electronic wonders. An investigation in the of the Makers World will not only enlighten the digital possibilities, it may also bring a new look to the analog world. Keep in mind that as this amazing shine is brought into the classroom, it must also be integrated with those important curriculum standards. One can only imagine what John Dewey may have done in today’s 21st century classroom. It is certain that he would have had the students helping him make those decisions by blending all the technology indicators I have shared. As you may now see, I really believe that PBL has always relied on some sort of technology, no matter how basic it may have been. After all, it is the tools that allow students to do. Remember that doing connects to learning. It is important for educators to understand that digital technology along with past and pre-analog tools can help foster a blended learning experience beyond the classroom and its physical walls, reaching to the community and a wonderful authentic world.